Employment is a critical part of the macro-economy and a key driver of economic development. India’s employment policy over the past three decades provides an important case study for understanding how government attitudes to the labour market contribute to an emerging economy’s growth and development. This study contains important insights on the policy challenges faced by one of the world’s most populous, labour abundant economies in securing employment in a context of structural change. 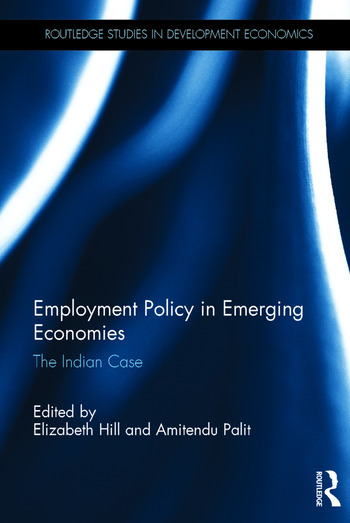 The book considers India’s approach to employment policy from a national and global perspective and whether policy settings promote employment intensive growth. Chapters in the first half of the volume evaluate India’s approach to employment policy within the national and international context. This includes the ILO Decent Work program, the national agenda for inclusive growth, and national regulatory frameworks for labour and education. Chapters in the second half of the volume focus on how employment policy works in practice and its impact on manufacturing workers, the self-employed, women, and rural workers. These chapters draw attention to the contradictions within the current policy regime and the need for new approaches. Employment Policy in Emerging Economies will interest scholars, policy makers and students of the Indian economy and South Asia more generally. It will support undergraduate and postgraduate academic teaching in courses on economic development, global political economy, the Indian economy and global labour. Elizabeth Hill is a Senior Lecturer in the Department of Political Economy at the University of Sydney, Australia. Amitendu Palit is Senior Research Fellow and Research Lead (Trade and Economic Policy) at the Institute of South Asian Studies (ISAS) in the National University of Singapore.